Online SQL editors are accessible using a web browser. This means that you don’t have to install a SQL editor on your desktop to develop your enterprise database applications. Instead, open your favorite browser, connect to an online SQL editor, and immediately start your SQL development. However, not all online SQL editors are made equal – some are more capable than others. For example, not all of these tools support all possible SQL implementations. Some are limited to supporting vendor-specific deployments, including those from leading database vendors. We review the top 5 best online SQL editors in this blog post. We summarize the features of each tool and look at their support for different SQL databases. SQL Fiddle is an open-source online SQL editor that was expressly made for testing and sharing solutions to database-related problems posted to StackOverflow and similar websites. You won’t be able to view the results of any SQL queries you write on SQL Fiddle in a side-by-side format. Instead, it allows exporting of SQL scripts to different formats, .e.g tabular, text, and markdown format. SQL Fiddle does support several databases, including MySQL 5.6, Oracle 11G R2, PostgreSQL 9.6 and 9.3, SQLite, and MS SQL Server 2017. This online editor, as its name suggests, supports SQLite 3.20.1 only, which is good, if you’re using SQLite. It does not offer any support nor documentation – you have to know SQLite inside and outside to take advantage of the tool’s capabilities. What counts in its favor is that it has a separate results column, where you can view your SQL scripts running just-in-time. 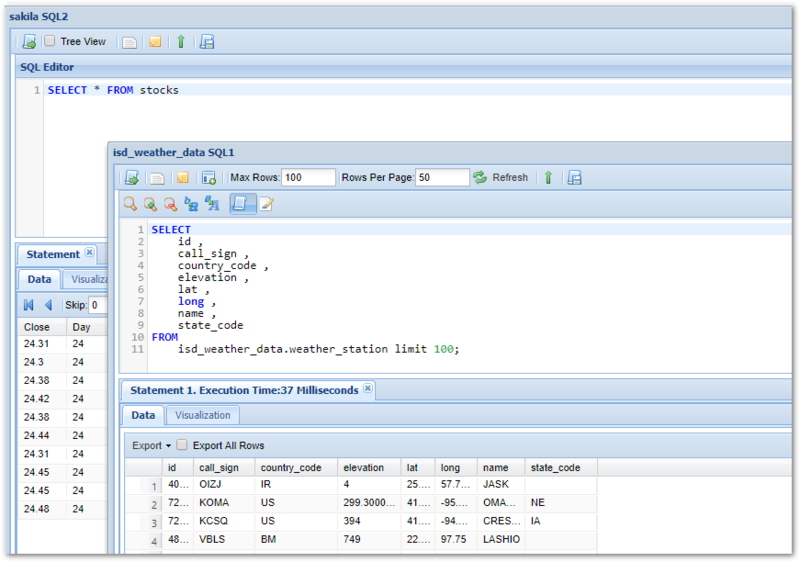 This online SQL editor has a window on the left where you enter your SQL; a window on the right displays the results of your SQL scripts in real time. DBHawk is a complete web-based database management and business analytics (BI) platform with drag-and-drop capabilities. It offers an online SQL query builder and an online SQL job scheduler, as well as ad-hoc reporting and database security and auditing capabilities. DBHawk also supports a wide variety of SQL, NoSQL, and cloud databases, which is not possible using the other tools in this list. Supported databases include Amazon Redshift, Athena S3, Cassandra, Greenplum, MongoDB, MySQL, Netezza, Oracle, PostgreSQL, SAP Hana, MS SQL Server, and Teradata. If you’re working on applications with various database backends, this is the tool for you. This tool is part of a tool suite and supports MySQL, MongoDB, and SQLite 3.21.0/3.9.2. You have to enter your SQL in a window at the top, then manually execute it to see its results at the bottom. You can then save the script to a file. The various other tools in the suite allow you to play around with various programming languages and frameworks, including C++, C#, PHP, VB.Net, NodeJS, and Go. Like SQL Fiddle, this tool from Oracle is more of a testing and sharing tool, but geared for SQL and PL/SQL. Other databases are not supported unless you are using standard SQL. Note that standard SQL may not work for all databases, though. If you are using Oracle, this would be a good tool to use, as it also generates data access examples for C, Java, and PHP. The tool comes complete with documentation and tutorials. Before deciding on which tool to adopt for your SQL development, it would be best to look at each and see if it meets your needs. Furthermore, don’t forget to evaluate the support and documentation available with each tool. This would ensure that your developers will be up and running with the tool in no time.